As your business continues to grow, IT infrastructure will experience a massive change in scale. If your company is on a growth trajectory, it’s time to start thinking about how intelligent automation with AIOps can play a crucial role in your IT operations. If you are new to AIOps, this article is a perfect place to start. Know what AIOps is, why you should use it, and how it will help your business. Coined by Gartner, AIOps or Algorithmic IT Operations platform is a solution that uses smart algorithms (powered by AI and ML), where machines solve known IT issues and intelligently automate repetitive and mundane jobs. It refers to a multi-layered technology platform that automates and enhances IT operations. AIOps uses analytics and machine learning in order to analyze big data from various IT operation tools and devices. As a result, it is able to automatically spot and more importantly react to issues in real time. Think of AIOps as a continuous integration and continuous deployment for core IT functions. It is important to understand that AIOps has two main components: Big Data and Machine Learning. AIOps requires a move away from siloed IT data. It uses a comprehensive analytics and machine learning strategy against the combined data. The resulting outcomes are intelligent insights that use automation to provide continuous improvements and fixes. It’s as simple as that! Through digital transformation, you can add more business value by saving tons of time and effort, and spend more time in innovation. AIOps adoption can help your organization to get end-to-end visibility into infrastructure and applications. Get better MTTD and MTTR as a bonus. As a DevOps engineer, for every CI/CD you build today, you will eventually need to deploy an automated trigger as a part of your CI/CD pipeline. With smart automation of codes, you can monitor the deployment for health metrics and invoke issue detection rollbacks quickly. Almost half of the organizations dealing with IT monitoring issues, spend on an average 1 hour repairing performance issues per incident. With AIOps, you can deploy automated actions (response mechanisms) for known events with embedded business logic. AIOps makes life easier for you. Say adios to midnight wake up calls! AIOps reduces the Mean Time to Detect (MTTD) by 60%. It does so by improving business agility through identifying intelligent management layers. With AIOps adoption you can also reduce MTTR (Mean Time to Repair) by more than 50%. So say goodbye to excessive stress and fatigue. With faster MTTR, you can eliminate alerts, repetitive events, and respond quickly to production incidents. Get greater visibility into your enterprise, information, network, and operations infrastructure. AIOps makes sure that you have the optimal visibility that you need for your business. AIOps platforms analyze vast volumes of IT telemetry from disparate sources, by applying various types of algorithms to the data in real time. Get used to getting real-time analysis and diagnosis of issues and actionable insights. With AIOps, you can conduct causal analysis and apply analytics to a broad and wide set of data. This will help you to easily identify and compare probable root causes of problematic issues. AIOps provides you with data-driven recommendations. These recommendations are based on both real-time as well as historical data to help you to carry out an informed decision-making process. Some of the key areas that AIOps adds value to include complete alert management, automation, machine learning, correlation, microservices monitoring, data management, advanced real-time analytics, and full-stack data monitoring. Some of the other AIOps benefits include reduction of a major portion of alert noise, elimination of human errors, better centralized governance, significant cost savings, wide data collection, modern user experience, and increased rapid time to value. If you think you don’t need AIOps because you have ITOA, think again. 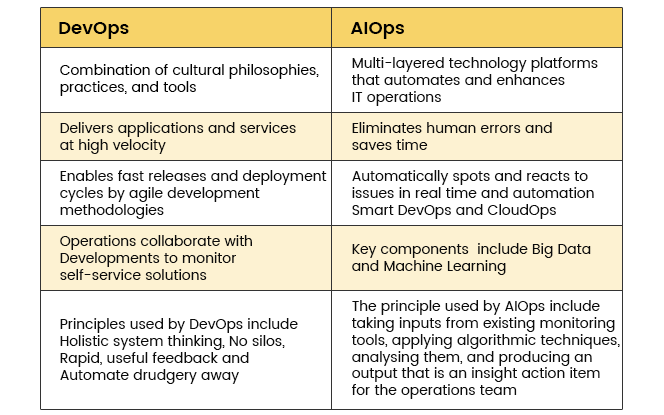 AIOps and ITOA are NOT the same. The major differentiator is the way the algorithms are applied to the data sources. Gartner says by 2019, a quarter of global enterprises will have strategically implemented an AIOps platform supporting two or more major IT operation functions. It’s time to start using IT operations that strategically leverage AIOps platforms. Afterall, the end goal of AIOps solutions is to make life better for you engineers out there. In the journey towards digital transformation, you can be a pioneer by using advanced methods to scale up DevOps. It’s time to think about what’s best for your business, will AIOps benefit you or are you ready to plunge into it? These are the questions you need to ask yourself right now.